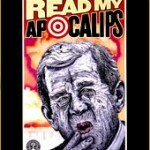 Inspired by the Reagan Administration, Robbie Conal began making satirical posters of politicians and bureaucrats who abused their power in the name of representative democracy. He developed an irregular guerrilla army of volunteers and put his posters up in the streets of major cities around the country. Robbie has gained national prominence as the country’s premiere poster artist; his work has been featured on CBS This Morning, Charlie Rose and in Time, Newsweek, The New York Times, LA Times, Washington Post, and The Wall Street Journal. He has authored two books; Art Attack: The Midnight Politics of a Guerrilla Poster Artist, and Artburn which is a selected collection from his monlthy art column in the LA Weekly free newspaper. He also teaches in the School of Fine Arts at the University of Southern California in Los Angeles. 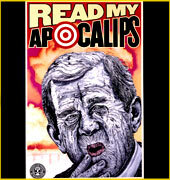 See www.robbieconal.com for more of his art attacks.